Mr. Ramathe Stanley Malope, was born on 14 January 1964 in Tumahole, Parys. He started his schooling at Tumahole Primary School (now called Lembethe Primary) and completed his secondary schooling at Phehellang Senior Secondary School in 1983. Malope obtained his Secondary Teachers’ Diploma from Mphohadi College of Education in 1986. He obtained a Further Education Diploma in Education Guidance at RAU College in 1996. Malope obtained his BEd (Honours) at the Rand Afrikaanse Universiteit (RAU) in 1999. He received his Human Resource Management Diploma (HRM – DIPL) from Business Management Training in 2002. Malope has completed certificate qualifications courses with various institutions to further enhance his skills in a number of competencies ranging from Computers, Facilitation, Project Management, Financial Management for Managers, to Human Resource Management for Supervisors. From 1987 to 1996, Malope taught at Phehellang Senior Secondary School. He also served the same school as Head of Department for Social Sciences. From 1990 to 1996, he served as the Acting Principal for Tumahole Adult Centre. Malope also served the Fezile Dabi Education District in various capacities from 1996 to 2001; being a Teacher Development and Appraisal (TDA) Officer from 1996 to 1999.In 2000, he was appointed as a School Management Developer (SMD) in the same District. From 2001 to 2006 Malope served as a Whole School Evaluation Supervisor at Head Office in Bloemfontein. From January 2007 to September 2008, he was the Deputy Director for Human Resources: Supervision and Management at the Fezile Dabi Education District. 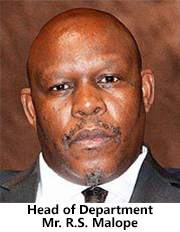 In October 2008, he was appointed by the Department of Sport, Arts and Culture as Corporate Human Resource Manager at PACOFS – a position which he held until 31 May 2009.Malope has also served in various capacities in other education structures, namely, as a founding member and secretary of the Tumahole Education Forum (TEF) in 1990, a convenor of the NEECC (National Education Coordinator Committee) Parys Branch in 1993, an EXCO Member of Phehellang Senior Secondary PTSA in 1995, and a member of the Fezile Dabi Education District Principals’ Council in 2007. From 1996 to 2000 and 2007 to 2008, he was appointed a Member of the Business-Education Partnership, and a council member of the Flavius Mareka FET College from 2007 to 2009. Malope has previously served as the Superintendent-General for Education in the Free State. Malope has served the ANC as a branch secretary in Parys from 1993 to 1995, a member of the ANC Northern Free State Region Education Desk from 1996 to 1998, and as a founding member and secretary of the Helen Joseph ANC Branch from 2000 to 2002. Malope was a founding member of the then Vaal Progressive Teachers’ Organisation (VAPTO), in which he served as a branch secretary. He later served as the Chairperson for the South African Democratic Teachers’ Union (SADTU) Parys Branch from 1991 to 1996.He was the Secretary and Church Warden/Chairperson of the Board from 1987 to 1994. In 2007, he was the Deputy Chairperson of the Sasolburg Cluster Committee, and a Council Member of the St Peters Anglican Church in Zamdela. Malope is married to Goitsemang. They are blessed with two children, a son, Tshepo, and a daughter, Regomoditswe.